A clever trick very popular as the spectators always expect the magic to go wrong. The blade cuts the cigarette, but passes magically through a finger . 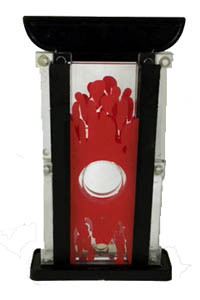 This model of the Finger Chopper has a unique locking mechanism and stands thorough examination. We have shown in to dozens of knowledgeable magicians, and they have not figured the clever secret. Highly recommended, as a very good buy for the price. Supplied ready to work, with instructions.